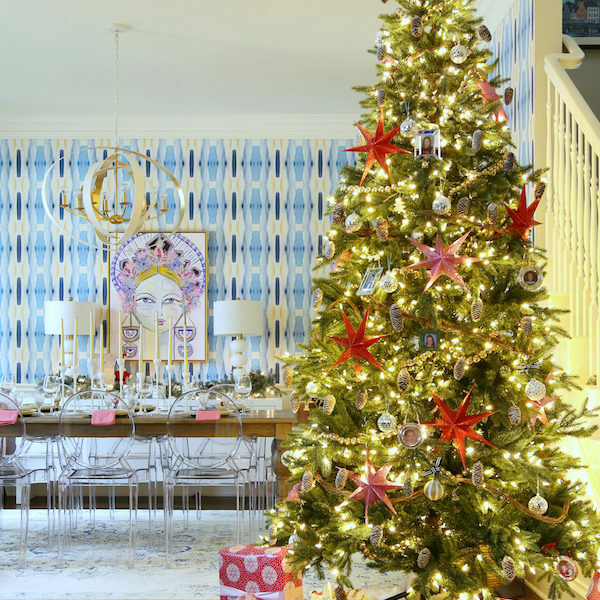 The Breakfast Room | hi Sugarplum! Is there anything better than a Summer weekend?! We had an equally lazy and productive weekend…most of which was spent outside. We added new plants and a sitting area to the backyard, then celebrated our hard work by inviting friends over for swimming and a cookout. Mr. SP has pretty much mastered the hamburgers, and I busted out a new simple dessert that was a real crowd-pleaser. I snapped a few pics, so hopefully they came out and I can share with you soon. We may have lived in this new house five months now, but the honeymoon has not worn off. 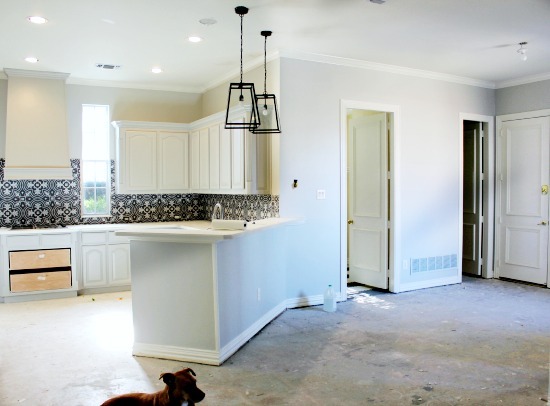 I still pinch myself every morning…and with each completed project, it feels even more like us and the house of my dreams. Now that the Kitchen is almost done, I’ve shifted my attention over to the Breakfast Room. 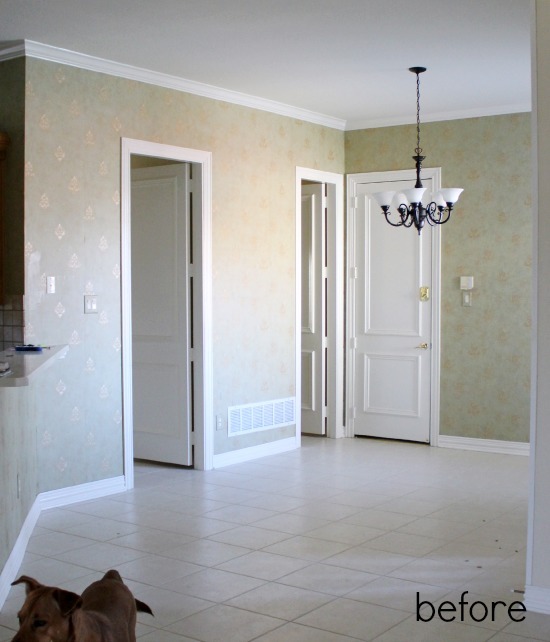 Here it is…in the month before we moved in…in all her wallpapered glory. 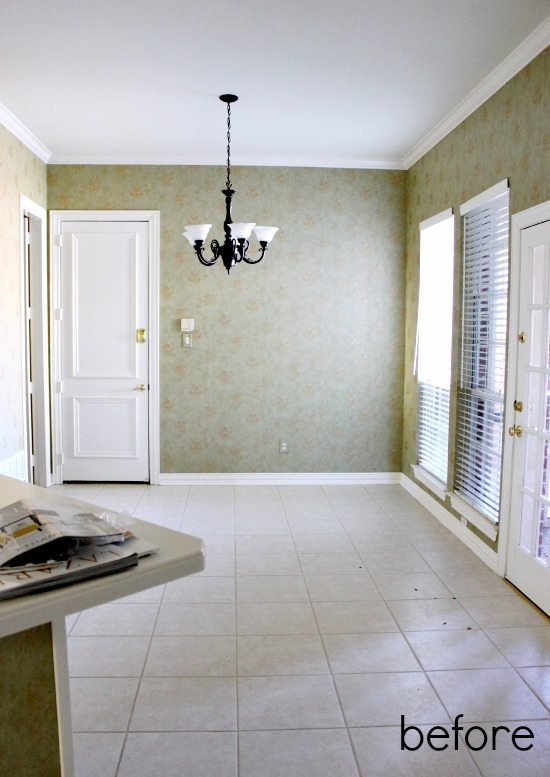 The door on the left is the Utility Room, and Powder Bath is in the middle. This door leads to the garage, and is our main entrance. 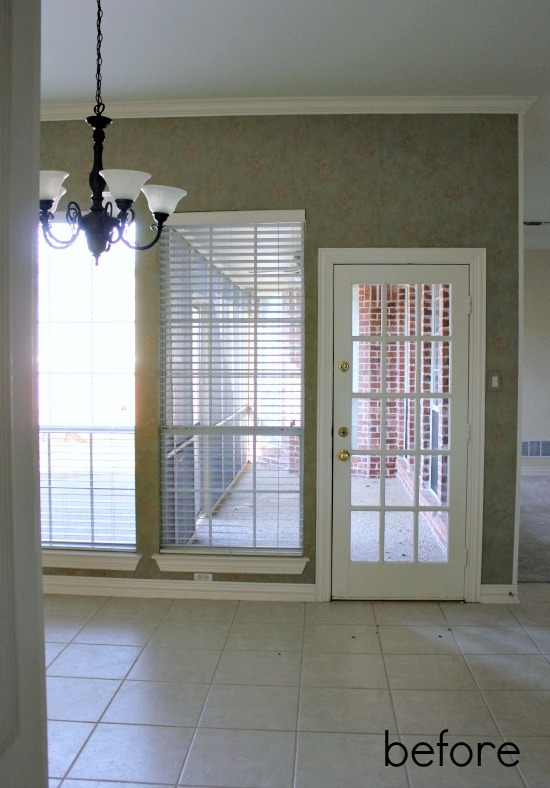 This door leads to the Screened Porch & windows overlook the backyard. 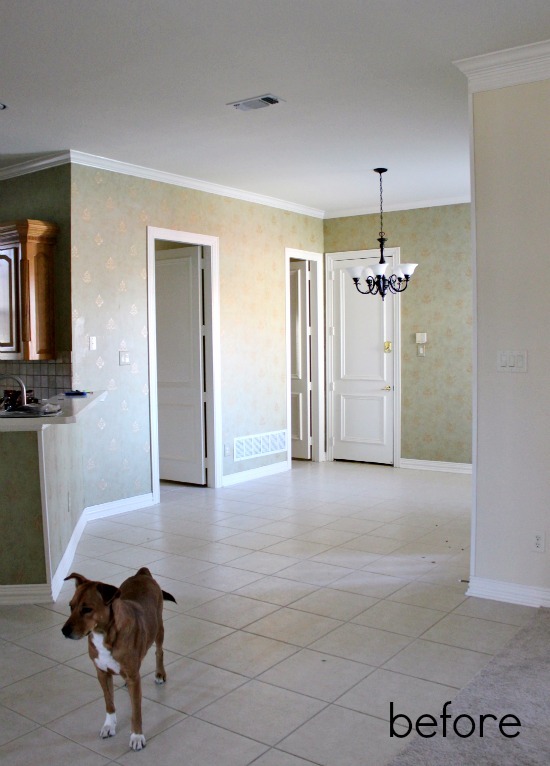 You may recall we owned the house for a month before we were able to move in, so we used that time for the main renovations…the Kitchen and downstairs hardwood floors. 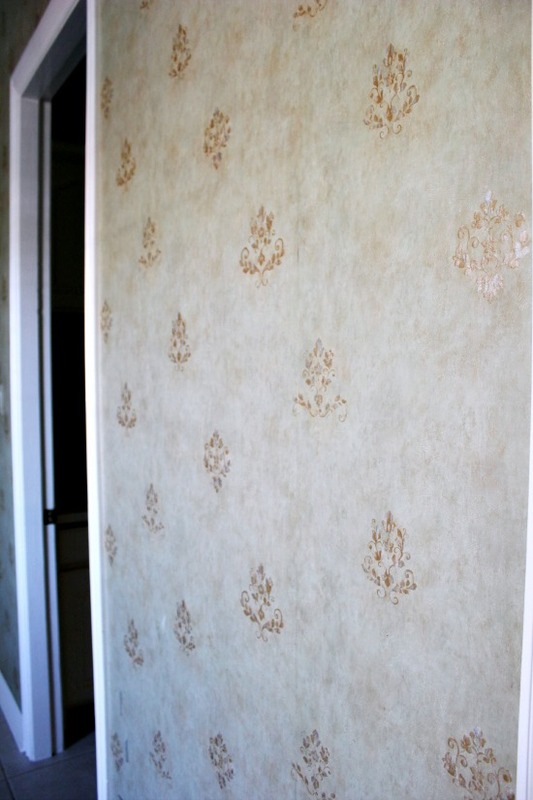 The funny thing about wallpaper, is I’m sure whomever selected this particular poop-green with metallic stamp pattern was positively giddy when it went up. They probably squealed and clapped when they saw the room for the first time. 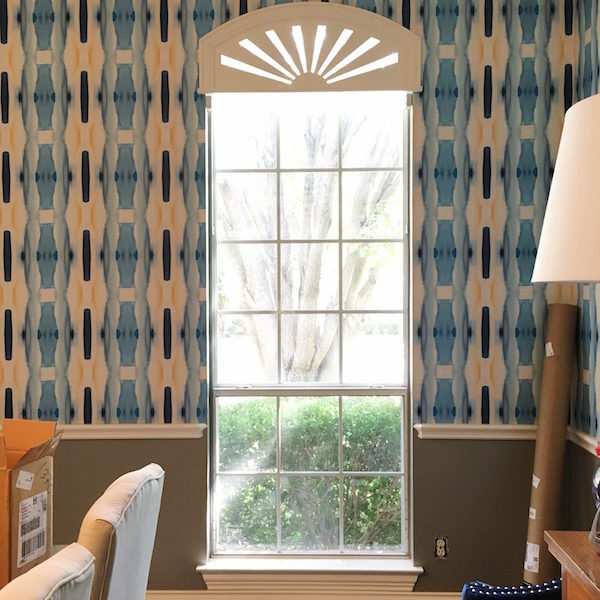 Kind of like I did with the wallpaper in this room. It’s hard to believe a future homeowner will think it’s so bad they have to rip it off before they can even move in. 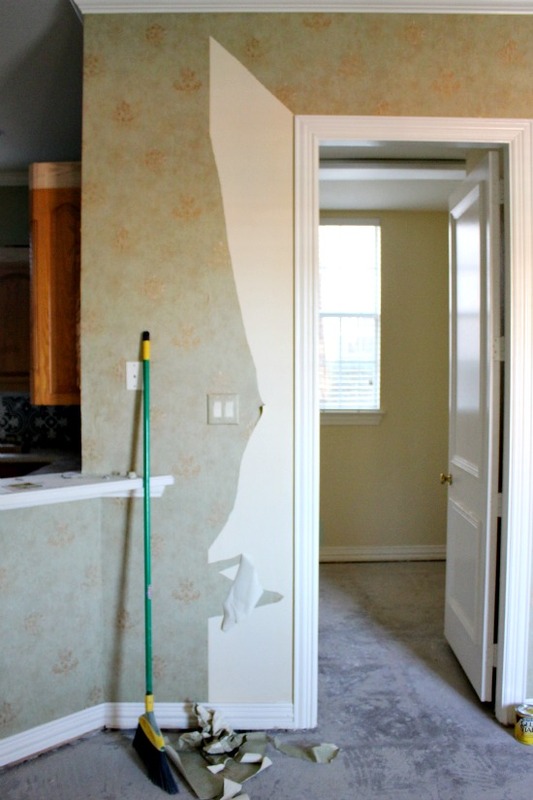 Once the wallpaper was painstakingly pulled off, the walls were floated and sanded. You know things were bad when primer is an improvement. 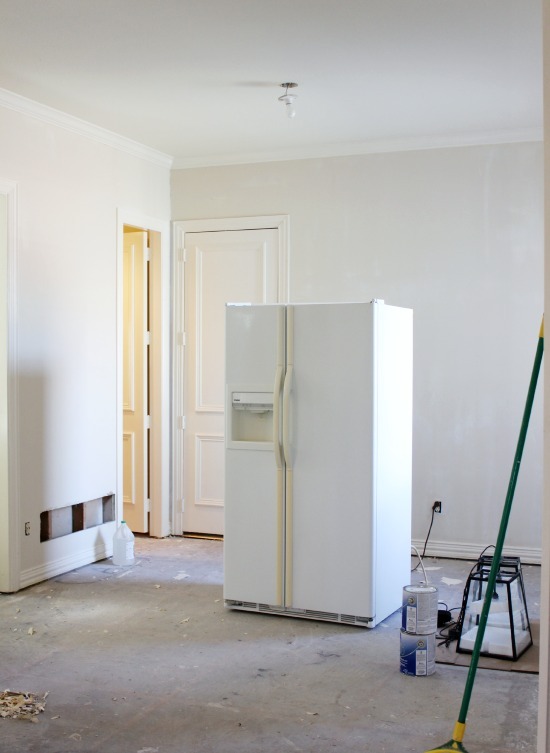 The walls were then painted the same color as the Kitchen, SW ‘Repose Gray’ at 50%. I donated the light fixture, too, in hopes that staring at a dangling bulb would push me to find a fixture more our style, sooner, rather than later. Joke’s on me…we’re still staring at the bulb. I know I want it to coordinate with the Kitchen lanterns, but that’s as far as I’ve gotten. You know, I don’t want to rush things. 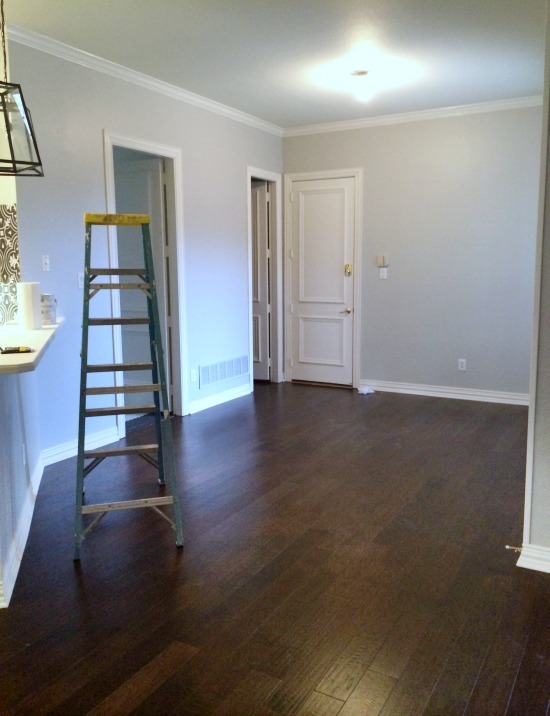 The final step before moving in was adding the wood floors. And to save you the exhaustion of scrolling back up…here’s one more look at the Before. I’d like to say the room has come even further in the last five months…but basically all we’ve done is buy new dishes and move our old Breakfast Room set in. The dining set, mind you, that lived in a room less than half the size of this one. The kids usually have breakfast at the Kitchen bar, but we eat dinner as a family every night…so this space is heavily utilized. And since we almost always have an extra kid at our table, I’d love take advantage of the larger space with more seating (specifically these!). My wheels are spinning and I’m excited to get started on this room! Do you have any ideas and inspiration for me? 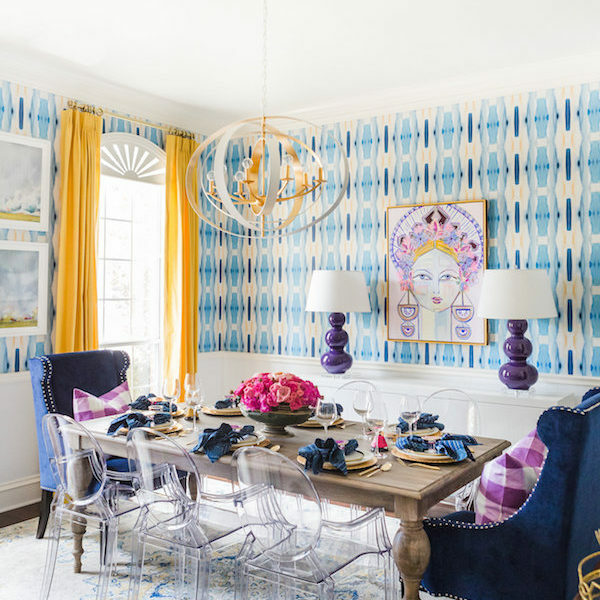 (One Room Challenge) Dining Room Reveal! Get the chairs!!!!! Holy moly they are gorgeous! oh heck yea on those chairs and hopefully they'll still be on sale when they're back in stock! I mean really at 50% off how cud u NOT get them!? I love the look of those chairs- beautiful!- but they look terribly uncomfortable. I love a table/chair that says linger, and there's no way that's a linger chair. 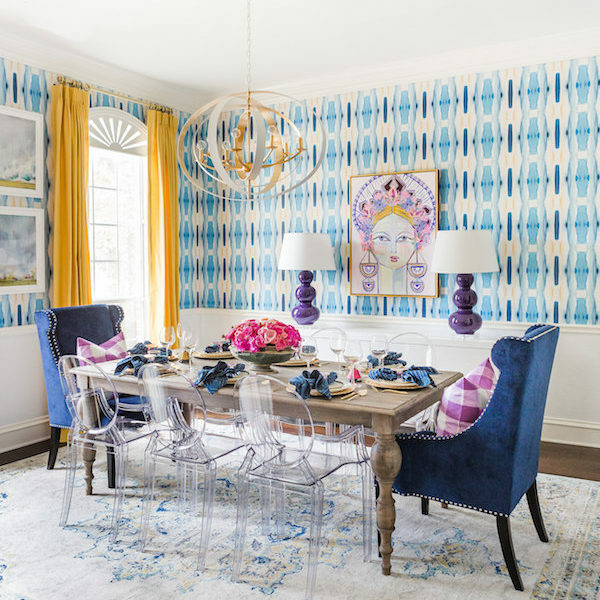 My fav for breakfast rooms are banquets with a round pedestal table and a couple of unexpected side chairs. You've got a great space for an L-shaped banquet, but you would have to block half the windows. I noticed you made mention this was a main entrance from the garage. Any thoughts as to a banquette for storage (off season coats, sports gear, etc)? Not a full blown mudroom but I wondered if you planned to make the space dual use. I am sure you could pull it off amazingly based on your awesome track record for creativity! Yay! I'm excited to follow along! We have a very similar lantern pendant in our small sitting room (the one from Ballard was a better scale for us) and we chose the Eclipse chandelier from West Elm to coordinate in our closely adjoining dining room – we love it and the shadows it creates on the ceiling! It's amazing the changes you've made so far. Gorgeous. Um, soooo gorgeous! It's going to look so good. 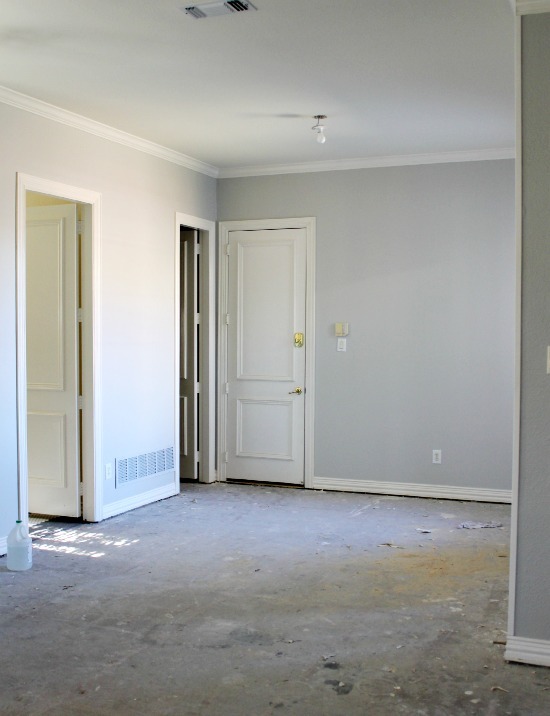 I know you'll put your signature colorful and fabulous flair on this space! I see…brass. And I think a big piece of colorful abstract art would look so good on that back wall. Want me to send you a painting?! It looks like a completely different space. I can't wait to see what you end up doing! Love the progress so far. Being honest, not a fan of the WM chairs. Just don't seem your style to me. I expected something a little more fun and family friendly with clean lines. Can't wait to see this room all finished! Settling into a new house takes way longer than I expected. We moved into ours in January and we still don't have a hood over our range, but the good news is the metal duct where it will someday be installed is hanging out of the ceiling all day every day #eyesore. It will come together! Your kitchen makes me NUTS!!! I keep looking at it/drooling over it. The tile is to die for. (Sorry, that's not a nice saying =). 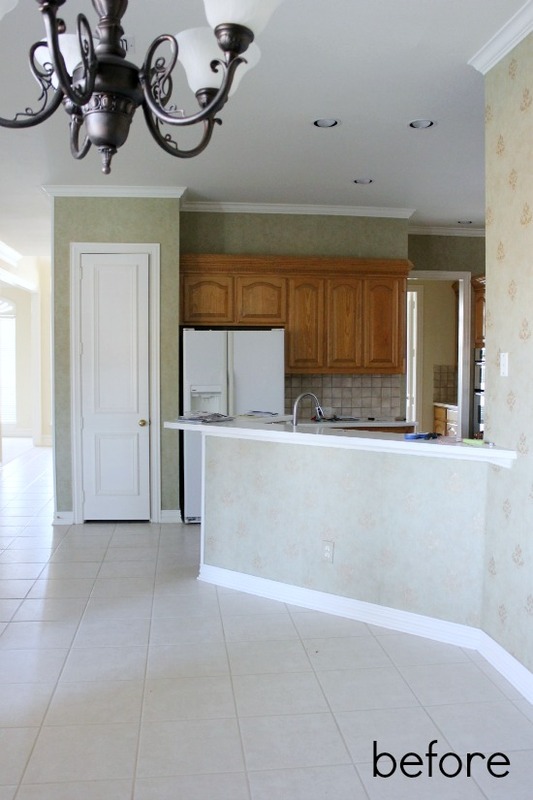 I desperately need a new light fixture for my dining room and kitchen area. When I say my house is dark, that's putting it lightly. Our house is 40+ years old, in Texas, and I think the original owners wanted a break from the sun. So I need something that casts as much light as possible. I came to your blog to look for ideas first! All of your rooms are super bright (compared). I'd love any ideas. Thank you!! !